Admission includes corn mazes, hayrides and over 45 family fun activities! View a list of included activities. No admission is necessary for simply picking pumpkins or visiting our Country Store. We accept Visa, MasterCard, and Discover for admission and pumpkin sales. An ATM is also available for your convenience. Season Passes can be used for unlimited visits throughout our fall season and include all of our general admission activities. Passes are non-transferable, non-refundable, and not valid for School Tours or Homeschool Days. Groups of 15 people or more are eligible to receive $1 off admission (not valid with other discounts). For more info, view our Group Rates and Rental Options. 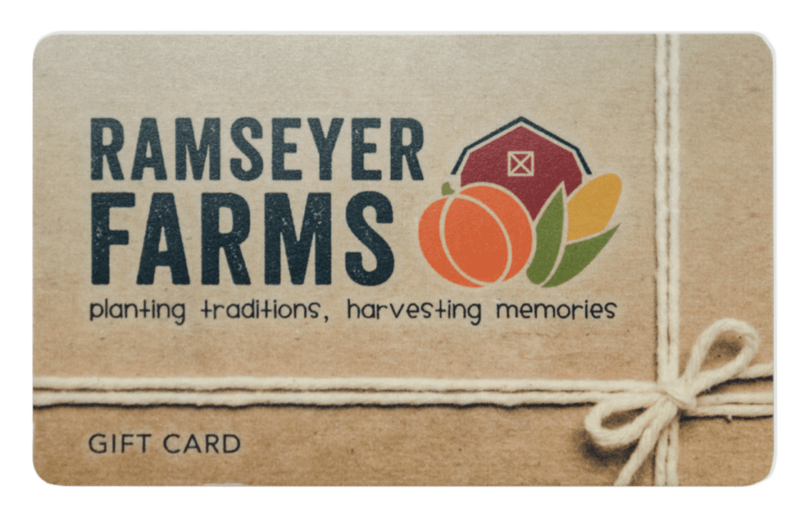 Give the gift of Ramseyer Farms! Our gift cards are redeemable for admission, pumpkins and other retail items in our Country Store, as well as any food sold by Ramseyer Farms (excludes outside vendors). Stop by our office (weekdays 9:30am-5:00pm) to purchase a gift card. A minimum amount of $20 is required.